At Fine Line Homes, we’ve found that many of our customers are interested in building custom energy-efficient homes on a rural acreage. To meet their varied lifestyle needs, we’ve developed three distinct Calgary home builders floor plans for large country lots. 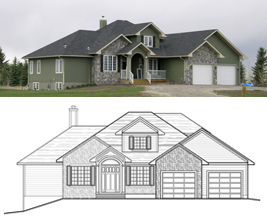 This is one of our most popular custom home floor plans in Calgary. Measuring a generous 2,200 square feet, this acreage layout offers a highly accessible floor plan divided into several demarcated but open-concept segments. The highlights of this floor plan include a large living room/media room that’s perfect for entertaining guests and an expansive country kitchen complete with a formal dining room and a private enclosed deck. With four bedrooms, this floor plan is perfect for large or growing families. If you’re looking for a larger layout, this 2,760 square foot design may be just what you’re looking for. With distinctive exterior architectural features including a front veranda, the sense of welcoming is apparent from the moment of your arrival. Inside, you’ll enjoy a luxurious and large kitchen, an ample master bedroom suite, and a main floor laundry room located just inside the triple attached garage. Out back, you’ll love the private covered deck and outdoor fireplace; it’s the perfect place to entertain guests or snuggle up on a cool Calgary night! This layout makes creative and prominent use of wood and other natural materials, heightening the sense of rustic beauty. If you’d like even more space, the basement can be expanded to meet your needs. 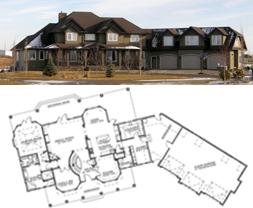 This spectacular 4,200 square foot country estate is the largest of our standard rural Calgary and area floor plans. Available with an optional 1,200 square foot loft, this five-bedroom home is spacious, well-appointed and tastefully finished from top to bottom. Unique touches include a breakfast nook, a formal dining room, and a built-in garage workshop. Of course, as a custom home builder, we’re also happy to accommodate your ideas. If you would like to add your own modifications to any of these floor plans, or if you’d like to design your very own custom home from scratch, we’ll work with you every step of the way to make your dreams a reality. Finally, be sure to thoroughly familiarize yourself with zoning and building by-laws that apply to the area in which you’ve decided to build. While we’re here to help you manage those details, there may be restrictions that limit the types of add-ons and building features you can customize, and knowledge of local regulations will help you avoid disappointment. Ready to Act? Need More Advice? If you’d like to learn more about our custom home floor plans for acreage in the Calgary area, or if you have any other questions about our energy-efficient houses, please contact us at Fine Line Homes. We are a full-service custom home builder, and we’re here every step of the way. We’ll help you find plot of land and choose the right floor plan, and we can even help you arrange financing. All our homes meet the most demanding energy efficiency standards in the country, and our homeowners enjoy higher-than-average resale values. 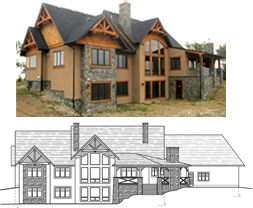 If you’re considering a custom build in the Calgary area, consider Fine Line Homes.